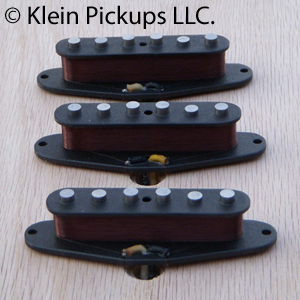 Dallas Blues Stratocaster Pickups: Constructed using Vintage Staggered Alnico 2 magnets, Enamel magnet wire and cloth lead wires. The best blues tone is achieved, funky deep bass, clean brilliant trebles, and a nice balanced mid range, is what makes this set the best. Use this set to play any range of Blues, Funk, or Classic rock. This set takes pedals very good. Wax potted to avoid unwanted microphonics. Output: Neck 7.25k, Middle 7.75k, Bridge 8.50k. All Pickups Hand Scatter wound for the best tonal response!